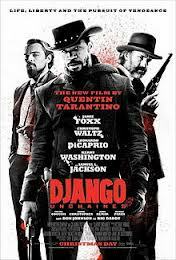 I had my misgivings about watching a pirated version of Quentin Tarantino latest “Django Unchained”. It felt almost sacrilegious to watch the great man’s work on the small screen. Tarantino’s films deserve the expensive big screen treatment, complete with popcorn and coke and maybe even chocolate. Let me be clear: I didn’t pirate the movie myself, I was given a copy and as I say, I had my misgivings. But to be honest, I might have felt a tad annoyed if I’d paid top dollar to see this film and popcorn charged at a 5000% mark-up. It’s very long (some judicious editing would have helped and I’ve since read that it was the first film Tarantino has made without regular editor Sally Menke, who died in 2010). And it’s got some very silly moments, the silliest by far being a ridiculous cameo by Tarantino himself, putting on a very bad Australian accent. What an Australian would be doing in the American wild west in the mid-1800s is the obvious question to ask, but given that it also added nothing to story or film, it made me wonder if Tarantino has got a little too clever for his own good. But it is an entertaining film, a Western with almost as much violence and gore as Kill Bill (the blood literally explodes off bodies) has a lot of very good scenes and some great songs and atmospheric music; but as the sum of its parts, it does not quite work. Eccentric German bounty hunter Dr Schultz (Christoph Waltz) frees slave Django (Jamie Foxx) and invites him to become his partner and fellow outlaw killer and share in the spoils. As a reward for his services, Schultz promises to help Django rescue his wife, Brunhilde (a fellow slave brought up by German speakers, hence the name) from Cotton plantation owner Calvin Candie (Leonardo Di Caprio) and his obsequious slave-hating butler Stephen (Samuel L. Jackson), one of the nastiest characters put on film by Tarantino. Along the way they kill a lot of people. there’s a lot of blood. A lot violence and gore. There’s a couple of great cameos from the likes of Jonah Hill as part of a group of bungling Klu Klux Klansmen who complain about how badly their wives have cut the holes into their hoods so they can’t see anything; Don Johnson plays a suave, bigoted plantation owner; and for Australian fans, Wolf Creek’s John Jarrett also pops up as another Australian somehow caught up in the American slave trade. Christoph Waltz as Dr Schultz is the standout character for me. Jamie Fox as Django is physically impressive and also plays his part with the right amount of style and swagger, but for me Waltz is the star as the happy-go-lucky, but deadly-with-a-pistol bounty hunter, masquerading as a dentist, with a tooth bobbing on the top of his carriage. He plays the role with real panache and is also by far the most likeable character in the film; an enlightened European, he treats Django as an equal, while just about everyone else in the film (including slaves themselves) calls slaves “niggers” (Somewhere, someone has tallied up the number of times the “N” word is used in the film and it must in the 100s. In his role as the bounty hunter, Waltz is almost the mirror image of Colonel Hans Lander, the smooth, despicably evil Nazi he played with Oscar-winning success in Inglorious Basterds. He is one of those actors that has real magnetism and the film is worth watching just for his performance alone. Leonardo Di Caprio is good as the wealthy, manipulative plantation boss Calvin Candie, but it did a feel a little as if he was going through the motions in this role, drawing on past characters he’s played. There’s also the usual snappy Tarantino dialogue through much of the film, especially in the early scenes between Django and Schultz, complimented by some beautiful shots of the American wilderness. But it’s a disjointed, uneven film that would have been a better film were it shorter, more tightly made. There’s the sense that Tarantino – the master film-maker and auteur that he is – can do anything and get away with it, hence his own silly Aussie cameo. In the end he looks a bit foolish and completely out-of-place (and out of his depth I am sorry to say) not quite sure where to place himself on camera. As for that accent – Strewth mate, you sound like a real drongo!